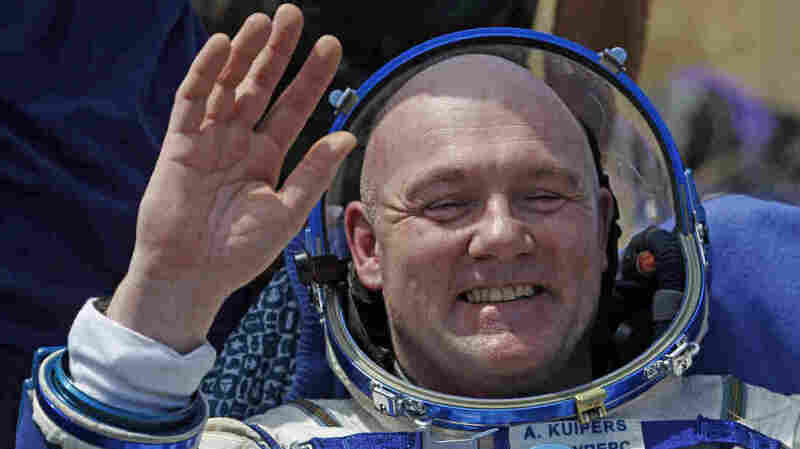 Astronaut Dials 911 From Space; No First Responders Show Up Dutch astronaut André Kuipers made the extra-long-distance call by accident, but he was "disappointed" when emergency responders didn't show up at the International Space Station. Astronaut André Kuipers, pictured here after a landing in 2012, accidentally dialed 911 from the International Space Station. Used to dialing 9 to call out when you're at work? So are astronauts. But that pesky, extra digit tripped up Dutch astronaut André Kuipers, when he accidentally called 911 from the International Space Station. The astronaut was trying to dial an international number, he told Dutch public broadcaster Nederlandse Omroep Stichting, when he erred. Floating inside the space station, he made a mistake many people make in regular gravity — he missed a number. "First you dial the 9 for an outside line, and then 011 for an international line," he explained. "I made a mistake, and the next day I received an email message: Did you call 911?" The 60-year-old astronaut hung up promptly when he realized his error, but the call triggered an alert some 200 miles below at Mission Control, in Houston. NASA security checked the room where the call was patched through. The astronaut, of course, was conspicuously absent. He shared his slip-up in a conversation with the Dutch broadcaster about Neil Armstrong's 1969 moon landing, noting that it's actually quite easy to call Earth from the space station these days — though there's often a time delay. Wayne Hale, who served as a flight director in NASA's Mission Control, tells NPR that astronauts in the International Space Station have been able to make calls as they please for more than a decade now. The phone system uses voice over Internet protocol, the same technology that lets Earthbound people place Internet calls over Skype. "A capability that was built into the ISS, with the rise of Internet phone calls, is the ability for the astronauts in the space station to just dial up anybody that they might want to," Hale said. "Many people have gotten calls from space." Holly Ridings, chief flight director at NASA, has received plenty of those calls. "You're carrying your phone around and it'll ring and it'll be the space station," she told Space Answers in 2013. "It's really actually kind of cool, it never gets old." Misdials from space are nothing new. British astronaut Tim Peake once issued an apology on Twitter for a mistaken call. I'd like to apologise to the lady I just called by mistake saying 'Hello, is this planet Earth?' - not a prank call...just a wrong number! And, no, it doesn't work the other way. You can't accidentally call the space station. Accidental 911 calls are old hat too, on the ground at least. Brian Fontes, CEO of the National Emergency Number Association, tells NPR unintentional 911 calls have been an issue for decades. Fontes says even he has slipped up. He accidentally phoned 911 when he was trying to dial an international number, just like Kuipers. "It happens," he says. "We're all humans; we all make mistakes." Perhaps Kuipers' bigger mistake was hanging up. Fontes says you should always stay on the line if you make an accidental emergency call. Otherwise, 911 officials might assume there's an emergency and dispatch personnel. Kuipers wouldn't have minded a visit. He jokes, "I was a little disappointed that they had not come up."